I began working at Sutantiran in 1962. Became associate editor in 1965. Elevated to the rank of editor in 1968. My public life began at the Federal Party. For the first time, I participated at the black flag demonstration to Sir John Kotelawala in 1954, when I was at 8th standard. Thereafter I also took part in Party’s anti-Sri campaign and 1961 Satyagraha campaign. I joined Sutantiran in 1962. Initially, I was involved with poetry. I also worked in Kalaichelvi and Thamil Arasu papers. In 1971, for the cause of ‘Newspaper Freedom’, I was placed for 2 days in ‘lock-up’ at the Kollupitiya police station. For umpteen times, I have been investigated at the Fourth Floor of C.I.D. building for days. Twenty years had passed since Kovai Mahesan (one of the colorful Eelam Tamil journalists in the last quarter of the 20th century) died on July 4, 1992 in Tamil Nadu, India. He was born Maheswara Sarma in Kopay, Jaffna, and was 52 at the time of his premature death. I consider him as my first mentor in journalism. With the exception of a few, not many remember him now. Whereas the Tamil journalists of his generation who were employed in news establishments owned by Sinhalese moguls lacked the will and spine to address the issues affecting the Tamil lives, Kovai Mahesan was an opposite for a 15 year period (1968 to 1993). Quite a section of Tamils, including the journalists, who lacked the courage for confrontational politics (or polemics, if his detractors termed it), found it difficult to taste Kovai Mahesan’s journalism. He was also one of the survivors of the infamous Welikade prison massacre in July 1983. A scanned photograph I provide nearby was taken in 1972, when S.J.V. Chelvayakam (the leader of Federal Party) visited Tamil Nadu. 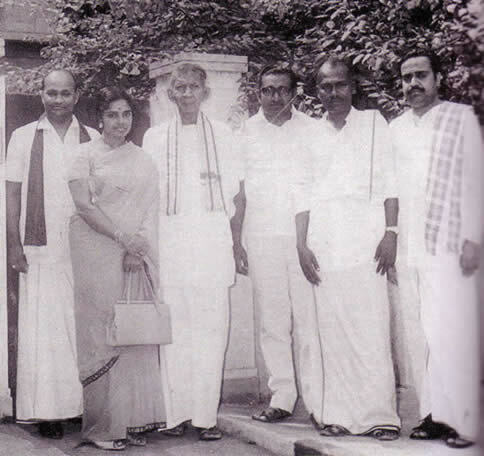 We see Kovai Mahesan (at extreme right) in the company of Chelva. He would have been 32 then. Kovai Mahesan was the editor of Sutantiran, the weekly newspaper owned by Chelva’s family for almost 15 years. Other personalities seen in the photo are (from left): A. Amirthalingam, Mrs. M. Amirthalingam, Chelva, A.P. Janarthanam (student leader of DMK, and later affiliated with MGR’s Anna DMK) and A.S. Manavaithambi (Indian Tamil leader in Sri Lanka, who later returned to India). This was taken on the occasion when Chelva and Amirthalingams visited Anna’s (C.N.Annadurai, that is) house. My brief eulogy to Kovai Mahesan appeared in the print edition of Tamil Nation (August 1992), which I reproduce below. 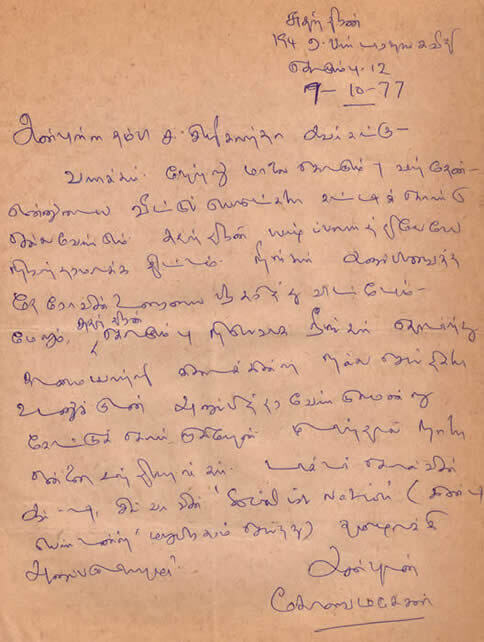 “With grateful admiration I record that it was Kovai Mahesan who propelled me to rise so far as a writer, by first publishing what I sent to Sutantiran, in January 1974. This was around the time when Periyar Ee.Ve.Ramasamy Naicker had died and when the 4th International Tamil Research Conference was being held in Jaffna. I wrote an eulogy to Periyar, as seen through the eyes of his disciple Arignar Anna. Since then, till I left Colombo in August 1981, quite frequently I mailed my writings to 194A Bandaranaike Mawatha, Colombo 12, and later 15 Mahatma Gandhi Road, Jaffna (these were the addresses in which Kovai Mahesan functioned as the editor of Sutantiran) and waiting anxiously every week to see whether my contributions had been passed by Mahesan. He did not disappoint me much. As all Eelam Tamils know, the revered leader S.J.V. Chelvanayakam was a man of few words. But when one wanted to learn what Chelva had in mind about the issues affecting the Tamils, Sutantiran was the only source one could look for reliable information. And the duty of carrying Chelva’s thoughts and actions into words fell on the editor of Sutantiran. In this respect, Kovai Mahesan rendered his duties with courage and conviction, while facing ridicule from fellow journalists, critics and politicians. On numerous occasions, he even had to face harassment by the law enforcement authorities. One can identify three classes of Tamil journalists in Sri Lanka. The first class was spineless, avoided any talk about the rights of Tamils and they mostly served as subservient reporters, commentators and editors of the Sinhala-managed publishing interests. The second class, did accept in principle that the rights of Tamils need recognition, but suffered from moral inanition. For the fear of losing their Sinhala friends, they couched their writings with Leftist ideology and criticized the political actions of Chelvanayakam as bourgeois leadership. The third class of journalists (to which Kovai Mahesan and the founding editor of Tamil Nation, S.Sivanayagam belonged) graduated from the Gandhian school of journalism: ‘Do not fear to tell the truth and suffer the consequences’ was one of Mahatma Gandhi’s guiding principles in journalism. Kovai Mahesan did just that. He exposed the brutal aggression of Sinhala regimes of SLFP and UNP and for umpteen times suffered the consequences. 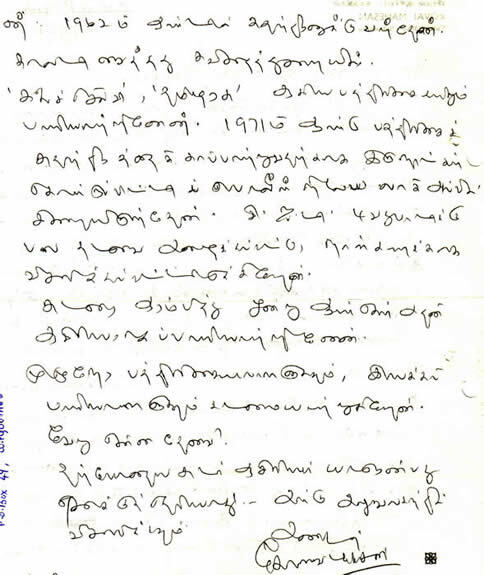 I still keep a few letters Mahesan and I exchanged in the late 1970s. I provide scans of two of them here. In one (dated January 19, 1979), he described his profile. I provide a Tamil translation. Then, he was living in Jaffna. If memory serves me well, Kovai Mahesan was the first Tamil journalist to be harassed by the Sri Lankan police and law enforcement investigators in Colombo in 1970s. Why I solicited his profile? As a precautionary measure (knowing that he was one of the marked Tamil activists of that era) I wanted to collect his profile directly from his own hand. Fine. Hope you are fine too. Received your review of Kalai Vizha souvenir. I have published it this week. I’m unable to publish your earlier submission on the history of Tamils yet. This is because, the cited references in English. Reason being, we don’t have so much English alphabets in the press here. If we omit the English citations, it will be of no use. After we get adequate English alphabets, it will be published. Also received your ‘fillers’. I began working at Sutantiran in 1962. Became associate editor in 1965. Elevated to the rank of editor in 1968. My public life began at the Federal Party. For the first time, I participated at the black flag demonstration to Sir John Kotelawala in 1954, when I was at 8th standard. Thereafter I also took part in Party’s anti-Sri campaign and 1961 Satyagraha campaign. I joined Sutantiran in 1962. Initially, I was involved with poetry. I also worked in Kalaichelvi and Thamil Arasu papers. In 1971, for the cause of ‘Newspaper Freedom’, I was placed for 2 days in ‘lock-up’ at the Kollupitiya police station. For umpteen times, I have been investigated at the Fourth Floor of C.I.D. building for days. Sudar magazine was inaugurated and for first 3 years, I served as its editor. I have been functioning as a full time journalist and an activist for the movement. What else is needed? I’m not sure, who is the current editor of Sudar? Please inquire at the office. Greetings. Yesterday afternoon I reached Colombo. I have to take my home goods [to Jaffna]. We’ve planned to establish Sutantiran in Jaffna, permanently. We have published the Thero’s speech, which you had sent us. Furthermore, I wish that you continue to work as Colombo’s reporter to Sutantiran and provide us with good copies immediately. If possible, come to meet me tomorrow. Can you translate [your] article related to Dr. Colvin R.de Silva’s talk in Socialist Nation (republished by Independent)? With regards. What Mahesan had written about “Thero’s speech” refers to a speech made by Ananda Mangala Thero at a meeting held the Thurston Hall, Colombo, under the auspices of the Ceylon Rationalist Society. As a member of this society, I was present at that meeting. This Buddhist priest (then visiting from Singapore) made a speech in good English, which was filled with bile. The title of his speech was ‘One Country, One Nation, Many People’. His featured target was my debut commentary on the 1977 general election results about how the Eelam Tamils had voted for the TULF, which appeared in the Tribune (Colombo) of Aug.27, 1977. I did learn a lesson from that episode which happened 35 years ago, that my English writing (the themes I chose and/or the style of presentation) did posssess the power to influence or irritate people’s thought process. It is better to be read, rather than being ignored! After the death of S.J.V. Chelvanayakam in April 1977 and the Sinhala-Tamil riots in August 1977, the then publisher S.C. Chandrahasan [son of Chelva] opted to move Sutantiran’s production from Colombo to Jaffna. And Kovai Mahesan moved to Jaffna. In between, in May 1977, I also moved from Colombo to Peradeniya. Though being a weekend visitor to Colombo, to the best of my ability, I fulfilled the request made by Kovai Mahesan to function as Colombo reporter to Sutantiran. It was an honorary job. In those days, not many big-name Tamil journalists or big-name Tamil writers were willing to work (for poor pay!) or to be identified with Sutantiran (for reasons of police harassment and to project their image as non-partisan neutrals). They wouldn’t touch Sutantiran with a barge pole. Even if their names appeared as a byline in Sutantiran, they ridiculously felt that they would be noted by the Colombo gumshoes and their job opportunities in Colombo would dry out. 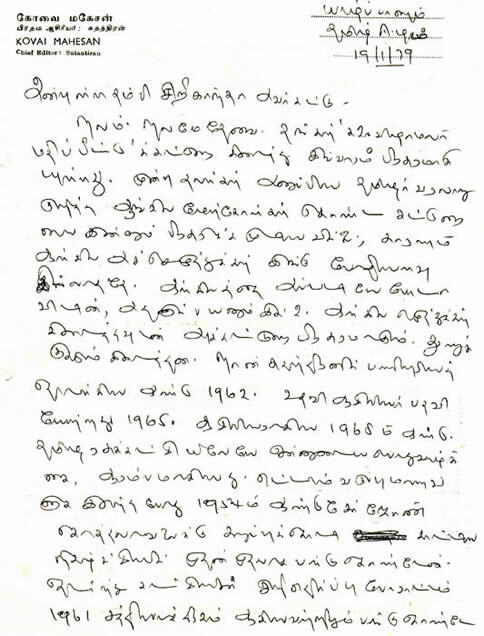 Kovai Mahesan receives occasional mention in journalist S.Sivanayagam’s 2005 memoir [Sri Lanka: Witness to History – a journalist’s memoirs (1930-2004)], as a survivor of the infamous Welikade Prison massacre of 1983, and as an activist in Tamil Nadu since July 1983. Sivanayagam also recorded the reason why Mahesan had to land in Welikade prison. According to him, there was a bomb blast on a train carriage and Mahesan, along with Dr. S.A.Tharmalingam who had formed a ginger group of TULF, called TELF (Tamil Eelam Liberation Front) was taken to Colombo from Jaffna, for questioning. The third prominent individual of TELF group was M.K.Eelaventhan (K. Kanagendran). In sum, Kovai Mahesan was a good writer of Tamil prose and remained as a good fighter for Tamil rights until his death. His writing did pinch the nerves of Colombo’s gumshoes occasionally and not many of the Tamil journalists of his era can boast about this merit.